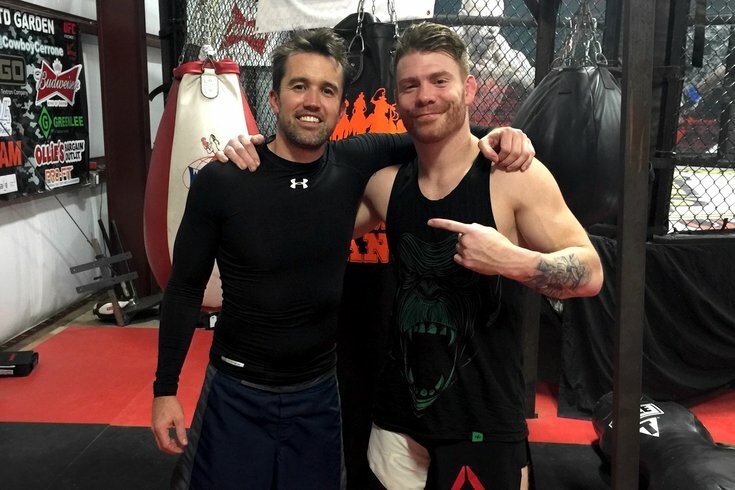 Rob McElhenney of "It's Always Sunny in Philadelphia" and UFC lightweight Paul Felder after a workout at Cowboy Cerrone's BMF Ranch in New Mexico. On Wednesday night, South Philly native Paul Felder will once again be in living rooms across the country. What makes this time different than all the others, however, is that the 32-year-old will be able watch himself. That, and there's no chance he winds up bloody and unconscious on the gray mat of a UFC octagon. The University of the Arts grad, who began competing in MMA while earning his acting degree, will be playing himself on "It's Always Sunny In Philadelphia" (FXX, 10 p.m.), alongside friend and fellow UFC fighter Donald "Cowboy" Cerrone, who is set to face Jorge Masvidal a few days later at UFC Fight Night. Felder -- yes, that's him on the toilet at the end of that clip -- mainly worked on stage prior to making fighting his full-time career. In Wednesday night's episode, he and Cerrone play a pair of fighters who are trying to cut weight by drinking Fight Milk, a "fitness drink" made of milk, crows' eggs, and booze that was invented by Mac and Charlie. If Fight Milk sounds familiar, that's because it first appeared during season eight, in an episode title "Frank's Back in Business" -- or, as I like to call it, "The Brian LeFeve Episode." So how did Felder wind up on a toilet -- he promised there's more than just the bathroom scene from the episode trailer --on one of his favorite shows, which set a network record for most viewers for the 12th season premiere? Originally, I was joking that I wanted to be one of the McPoyle brothers and come in drinking milk and wearing a robe. He can thank his training partner, Cerrone, who also happened to become friends with St. Joe's Prep grad and "Always Sunny" creator Rob McElhenney. On the show, he plays Mac. In real life, McElhenney is an avid UFC fan and has trained with Cerrone at the BMF Ranch in New Mexico after the two became friendly over four years ago. "I've done a couple other movies here and there," Cerrone told PhillyVoice in a recent phone interview. "But, man, 'Always Sunny' was a good time. I had a great experience. Rob and I are good friends. We met at a UFC fight in L.A. something like four years ago. "I was a fan [before I met him]. I have all the seasons on DVD and I've watched them all. I'm excited tomorrow to watch myself and Paul on it." Cerrone knew that Felder, who has a cat named Rum Ham, was also a fan of the show. So once he and McElhenney became friends, Cerrone wanted to introduce his fight-obsessed actor friend who made a TV show about Philly to his theatre-obsessed fighter friend who he actually refers to as "Philly." PhillyVoice: So how did it all come about? FELDER: “When we were out there, we were just joking around about the show and how awesome it would be to be on the show. And I got talking to Rob [McElhenney] about how I went to school for acting and this and that. He said, ‘I’d love to have you and Cowboy [Cerrone] on,” because we all kind of hit it off and had a good time with him. But, at the time, we couldn’t figure out how we were going to do it, whether we were going to play characters or play ourselves. And you’re from South Philly, so it's basically taking place in your backyard. “I’ve got to say when Frank and the gang go to the Jersey Shore and rum-ham is brought out. I mean, rum-ham is one of my favorite— one of our cats back home, we named him Rum Ham. I should say my girlfriend named him that, which is a good job by her. “When Dee takes steroids and fights, that another great one. I could list 10 of them if I sat and thought about it. “It was fun. I fought the week before filming so I was nervous going into my fight that I was going to be all banged up and not sure that I would be able to go out there and do it. And they knew that going in, that they might have to figure something out. So I fought in Vegas, flew home [to Philly] for two days, and then flew first class out to L.A. I got to see a couple friends I hadn’t seen in years, we went to the Rockhold-Bisping fight -- we filmed some stuff prior to the weigh-in for that fight." Were there any really funny on-set moments? What was it like between takes? “You don’t realize how funny and how much those guys play off each other. You can tell from watching, if you’re a fan of the show, some of that is made up and off-the-cuff. And I can tell you, it is. They would come in, for the one scene that we did, with a new way that they entered into the scene every time and with new opening lines — because the beginning of the scene was ad-lib — and the sh*t they would say to each other. I mean, me and Cowboy were sitting there biting our tongues trying not to laugh at these guys. They’re really funny and everybody’s just so nice. Everyone from the gang, is great. Is this the biggest role you’ve ever had? Did they appreciate — or at least seem to notice — the fact that you had acted before? Do you think this will lead to more acting jobs down the line? UFC made it official on Monday that Felder would face Alessandro Ricci at UFC Fight Night 105 on February 19 in Halifax, Nova Scotia. “It’s where I debuted. It’s all seems — it’s just one of those things — it all seems like it’s happening for a reason." Felder was originally supposed to face Gilbert Burns at UFC 208 in Brooklyn, but that fight was scrapped when Burns was pulled out with an injury. Despite now having to travel north of the border -- and much farther from home -- the lightweight doesn't seem to mind. “I’m more excited to fight a guy like Alex Ricci," he said. "He’s a Muay Thai guy. He’s a boxer. He’s got a very traditional striking style, like myself, so I think we’re going to bang it out. We’re going to stand and trade [punches]. I’m comfortable wherever this fight goes. I’m not afraid to go to the ground; I’m not afraid to initiate some wrestling, make it dirty. Felder lost his last fight (to Francisco Trinaldo) back in September when a large cut on his face forced the doctor to stop the bout in the third round. As for Cerrone, who has won four straight and 10 of his last 11, he'll face Jorge Masvidal on Saturday night as the 10th-ranked welterweight. "It's going to be one hell of a fight," Cerrone said. "I'm excited about it." Cowboy is not just one of the most-active UFC fighters -- he's fought four times per year every year since 2013 -- he's also one of the most entertaining. In his 40 UFC bouts (32-7, 1 NC), Cerrone has earned fight-night bonuses in 18 of them (5 Performance of the Night, 8 Fight of the Night, 3 Knockout of the Night, and 2 Submission of the Nights), something he attributes to a combination of "style and personality" -- and all that winning doesn't hurt either. Against Masvidal, Cerrone sees another opportunity for to cash in. "I'm going out there looking for a finish, and I think Jorge lines up great for a 'Finish of the Night,'" he added.